For the second straight year, The Library Book Club has decided to kick off our reading year with…a film. 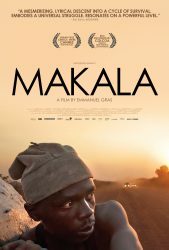 Makala (2018) is an internationally admired documentary that tells the story of Kasongo, a Congolese man living in a village with his wife and daughters, who dreams of purchasing a plot of land on which to build a home for his family. He sees his opportunity to earn money by selling charcoal from a mighty hardwood tree he has felled and baked in an earthen oven. Loading up the bags of charcoal onto the back of his bicycle, Kasongo sets off on a daunting journey across treacherous roads to sell his product at market. Before returning to his village, Kasongo attends a revival service and prays for God’s protection and strength. This is a thought-provoking and inspiring film about human aspiration and faith in God. The film will be shown on Wednesday, October 31 at 5:00 pm in Screening Room A (1st floor of COM building on the left side). Following the screening (96 minutes), professors of cinema Pete Fraser and Andrew Quicke will lead a discussion on the cinematic and Christian aspects of the film. For more information about this or future Book Club events, please contact Harold Henkel at harohen@regent.edu. This entry was posted in Special Events and tagged Book Club, Congo, film, Makala on October 11, 2018 by Harold Henkel.